The people of Ashiya are very proud of the Ashiyagama iron kettles used in the tea ceremony, and many regretted the cessation of their production. Numerous citizens called for resumed production of Ashiyagama, and seven years after its initial conception, Ashiyagama no Sato opened its doors in May of 1995. 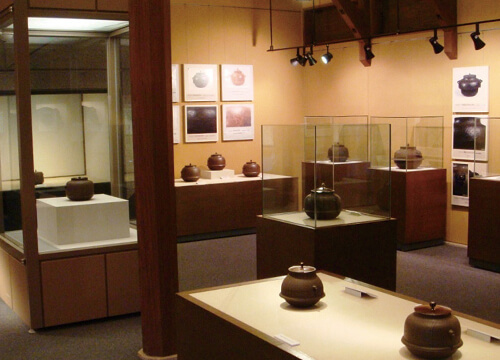 As one takes a stroll through the buildings of Ashiyagama no Sato, the visitor discovers the world of the tea ceremony and traditional Japanese aesthetics. The visitor is transported to another place and time. The beauty, history and production technique of the Ashiyagama are introduced here. These two buildings are used by practitioners of the tea ceremony. When the tea cere mony is not being performed, visitors are welcome to enjoy the atmosphere of the teahouses at their leisure.The observation deck of the Great Tea House provides a fine view of the gardens and The Small Tea House. Taking in the beauty of the grounds, the viewer is allowed to experience sensations but seldom felt by people of today's world. This is a place to drink tea in a free and relaxed atmosphere, without reservation or fretting over etiquette. Make yourself at home after touring the grounds. This is where the Ashiyagama are actually made. Foundries for making tea ceremony kettles are quite rare in Japan. Notice the intense concentration in the eyes of the crafstmen. This garden captures the flavor of Ashiya town and is based on very old and traditional garden designs. Relax to the songs of the birds,and enjoy the colors of the seasonal flowers in bloom. The custom of drinking tea is believed to have been introduced to Japan from China at the beginning of the thirteenth century. Favored for its soothing effects and medicinal uses by Buddhist priests and members of the aristocracy, it soon became very popular throughout many segments of society. The tea ceremony is an elaborate framework of etiquette and courtesies intended to foster a spirit of tranquility. It was established by the late sixteenth century and continues to have lnany Practitioners today. It is one of the representative caltural forms of Japan. 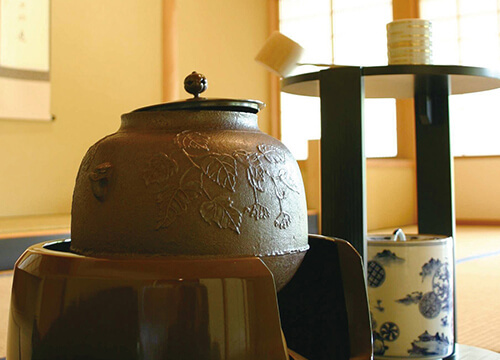 Ashiyagama is a variety of iron kettle used in the tea ceremony and made in Ashiya. The date of their first production is not known conclusively, but many outstanding artistic examples of the Ashiyagama date from the later years of the Nanbokucho Era (the first half of the fourteenth century.) Their production ceased sometime around the early Edo period (early seventeenth century.) 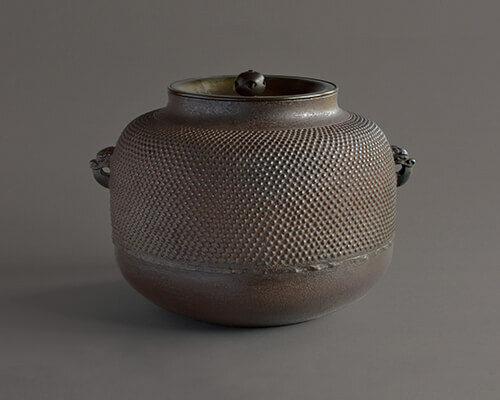 The Ashiyagama was prized over other iron kettles used in the tea ceremony. It was more elegant in style and of higher quality than the rest. Accordingly, practitioners of the tea ceremony and members of the nobility cane to hold it in high esteem. The Ashiyagama is greatly valued today, as well. The Japanese government has designated eight of then as important national treasures. Of first note is the Ashiyagama shape, known as "shinnari". Its natural form harmonized well with its function as a utensil for boiling water. A second point of interest are the elegant designs attached to the body of the Ashiyagama. Also, the kettle lugs or handles merit attention as they are often representations of an ogre's face. These characteristics are not to be found in other tea ceremony kettles built elsewhere. Ashiya's ironcasters and crafstmen were not tied to traditional convention and designs, but formed each piece according to its unique temperament and inherent characteristics. As a result, each crafstman's spirit and skill are reflected in the Ashiyagama, as well. The finished products undoubtedly display an aesthetic delicacy and lightness, but the Ashiyagama is also a sturdy example of expertise and skilled craftsmanship. The later years of Ashiyagama production also saw many Variations in its defining traits, for example, alterations in the "shinnari" form and a raising of the kettle lugs. Please take a look at the photographs in the information center. The Ashiyagama is' made of cast iron, and today's production technique has not changed fundamentally from the original procedure. Outer molds and inner molds are fashioned from casting clay. The molds are fitted tightly together, and molten iron (over 1300℃ ) is poured in between the molds. Once the iron has cooled, the outer and inner molds are broken open, and the casted item is removed. 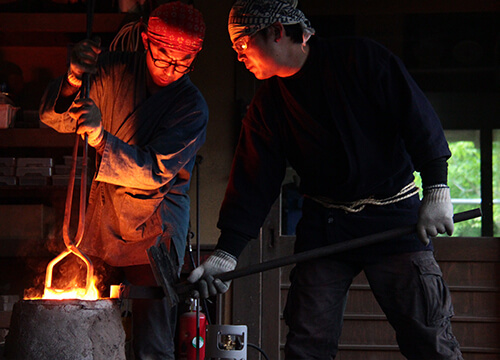 Metal casting is one of the arts for which Japan is known throughout the world, and the artists who make the Ashiyagama tea ceremony kettles combine skills of design with those of working with metals at very. high temperatures. Please look at the casting tools in the information center and in the studio foundry.